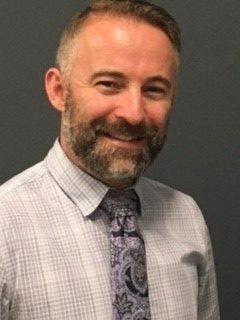 Philip Evans, a development specialist for the Americas, recently earned an IB advanced certificate in leadership research concurrently as he earned a Master of Arts in educational leadership and management. Pursuit of this dual credential is possible through Royal Roads University’s online program, which has an on-campus residential component. Phil began his studies a year before joining the IB staff, while working in a US school. We were eager to hear how he managed. IB educators often report heavily packed schedules. What led you to fit this two-year degree and certificate program into your busy life? I love learning and it had been 10 years since I’d studied. I was in an executive leadership position in a school and I wanted to earn a qualification to match the skills I was developing. It was really exciting to take on the program because I could see where and why things had been successful by reading the theory. Then there were things I could look at [and say], “Oh, that’s why I fell flat on my face,” or “that’s why that was perceived in a particular way or didn’t roll out the way I’d hoped.” I learned a lot being on the job and putting it together with university-level learning. What were your hopes when you enrolled? I became an educator because of learning I observed in pre-school-aged kids. It sparked my interest and my curiosity about how all of us learn. After being in the classroom for seven or eight years, I realized there were obstacles to learning; many were leadership oriented. I wanted to understand why people led in a particular way. There is a threat in classrooms and up the organizational ladder of school systems. It can produce negative outcomes for leaders. My hope was to learn how to navigate obstacles in a way that would serve my colleagues, our students, and make me better at what I do, all at once. How has your professional outlook on leadership evolved since you completed the program? It’s still changing. I have gained perspective about how I should continue to develop myself. I’m aware that I should be less directive and more conscious of how other people come to their understandings. I want to apply a positive, provocative approach to raise deep questions and create a safe space where people can think about them, in detail, and envision what happens several steps after a solution is applied. Rather than push or pull people in a particular direction, I like to find ways to draw people out of themselves, so they might discover how to minimize threatening or overwhelming elements, and see them as opportunities. Sometimes challenges can be diminished simply by partnering the right colleagues together to solve a problem. How has your leadership capacity expanded? Building capacity in others makes a work force stronger. I try to model and provide opportunities for exploration rather than give a five-step process that inhibits creative, innovative thinking in problem-solving. Everyone has the capacity to be a leader. That’s what generative leadership is all about: developing people to co-lead. I discovered that good leadership is about finding ways to understand other people. If you can understand yourself and what motivates you and how you respond under pressure and under different situations, you can appreciate how another person may respond to your ideas. Encouraging people to believe in their own capacity is part of effective leadership: People who believe in themselves can lead. How did the residential portion of the program aid your learning? People younger than me, from great undergraduate programs, who were teaching, who were aspiring leaders and already thinking ‘outside the box’ taught me lots of things. In contrast, we had people with advanced degrees, in leadership positions who brought great experience. Working together, we navigated the logistics of online learning and sorted out project approaches before starting. Despite time zone differences, no final decisions were made unless we were synchronized. We demonstrated generative leadership to ourselves. Any advice for aspiring leaders? Come back to learning to be enriched. Choose what resonates with you. Don’t just do it to get it done or tick off a box. It takes open-mindedness and a certain capacity to reflect. Being a leader is a big call and requires the ability to look internally and to confront yourself. The IB cooperates with many highly-regarded universities globally to offer IB certificates in teaching and learning, and IB certificates in leadership. In addition, the IB offers leadership workshops that provide foundation for developing your unique leadership capacity.